Moving time: 6 hr 16 min. 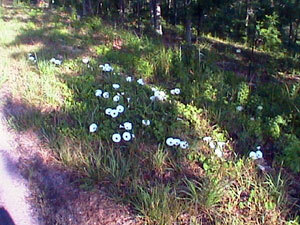 Weather: 72°F in the morning with a high dew point; got up to 92°F by 4:00 at end of ride. Partly cloudy for a while in the late morning but then clearing after noon. I didn't get a great night's sleep last night. The locals ran their ATVs up and down the road by the park, they set off fireworks all over town, and animals were on the prowl. There was a pack of stray dogs that ran all around the pavilion I was sleeping under chasing other animals. They also rummaged through the garbage cans in the park with quite a racket. This was a tough day of riding. I got a semi-late start (7:45am) and stopeed for a while at some attractions. 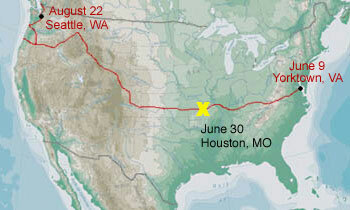 The first 30 miles of the trip were very tough. I did over100 feet of climbing per mile of travel for the first 25 miles with little net gain in elevation. I though I was back in the Appalachians again! The hardest part is over now that I'm up on a plateau west of the Ozark National Scenic Waterways. There is little elevation change from here to Kansas where I will begin a very gradual ascent to the beginning of the Rockies. 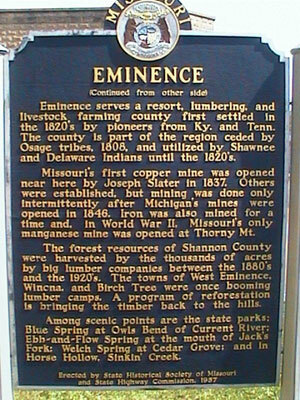 Eminence, Missouri reminds me of Ohiopyle and Confluence, Pennsylvania on the Youghiogheny River in the southwest corner of the state. 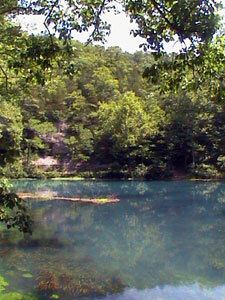 This is the Ozark's headquarters for canoeing,, rafting and inner tubing. The rivers are more sedate than the Youghiogheny but still very enjoyable to float. 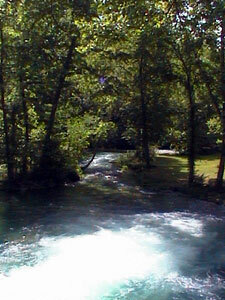 The spring fed rivers and streams are quite cold all year round and usually crystal clear. Outfitters seem to enjoy a brisk amount of business in the summer months and the local businesses rely heavily on tourism. 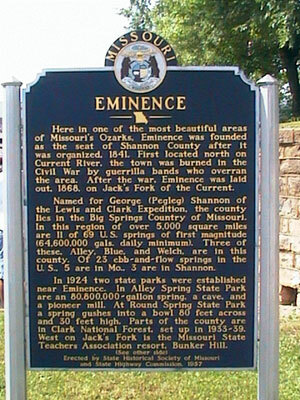 The first two pictures show the front and back of the town's history sign. 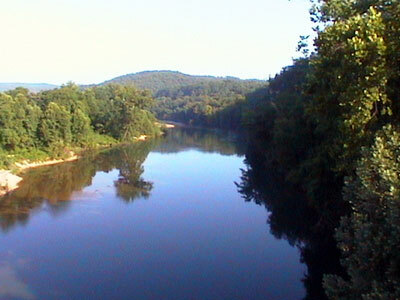 The second is of the Current River. The highlight of the day was Alley Spring, a National Park Service site about five miles west of Eminence. 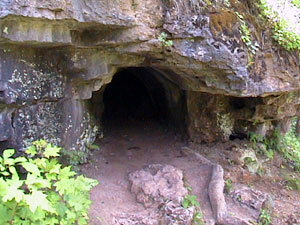 This spring bubbles up from underground at a rate of 81 million gallons per day. The water is crystal clear and quite cool - it flows at an outstanding rate much like Big Spring in Bellfonte, Pennsylvania near where I'm from. I think this spring has a higher flow rate. 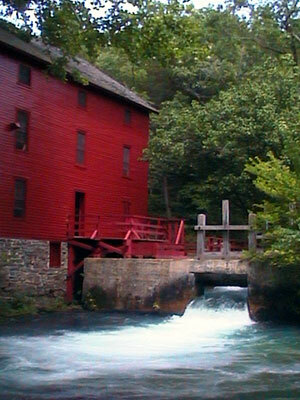 A mill was built on the spring to grind and process wheat in the 1800s and has been restored to its original condition with replicas of the original mill works. There was a long, hard climb out of Alley Spring up onto a large plateau. 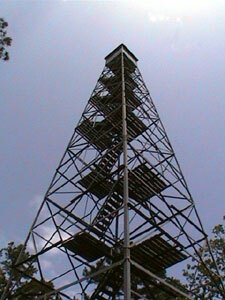 There is a fire tower that the public is permitted to climb. 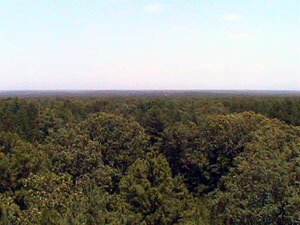 Here is a picture of the tower and one of the great view from the top. Today was a day of buffets. I had a breakfast buffet at the TNT Diner in Eminence for $7.00 (rip off) and dinner buffet at Pizza Express in Houston for $7.00 (great deal!). I love to get my money's worth at buffets but find that I can't eat quite as much as I usually can. Maybe my stomach has shrunk? People continue to be thick-skinned and arrogant here in Missouri. The only reprieve from the bad attitude is when I talk with tourists at parks. I hear that Kansans are much nicer. Out of state tourists are the only people who give me any sort of right-of-way on the roads. The locals just blow right past me within a few feet with little regard for my safety. Hotel: $29.70 and well worth it!